John and Getrude have the ambition to offer all the children within their programme quality education. For the youngest children, they run a nursery school themselves. The children in primary school have to walk about 1 km to reach the primary schools within the location. Those at high school have to walk a distance of 5 kilometers to reach the few high school we have within the location. To find enough finance to send all these children to primary and to High School is difficult. 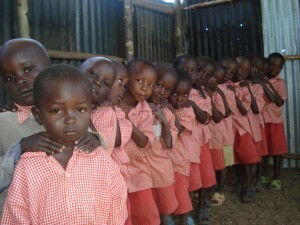 The children need school uniforms, school fee and books. To have an own Primary and high school in their community is their huge ambition!! A small temporary classroom for the nursery school was built last year. In the past, they used to educate the young children under the tree with only a shade but with no protection against the rain and the scorching sun. Every month it is a huge struggle to find enough finance to pay the salary for the teachers in the Nursery school. Their own Nursery needs more financial support! !